Governor of Poker is a poker tycoon game for Windows like you’ve never seen before ! Do you have what it takes to play against the Pro players of the old western ? Dare to join a poker tournament or a cash game and perhaps bet ALL IN. Does it satisfy you to totally clean the table of players and win all their cash and even their property ? 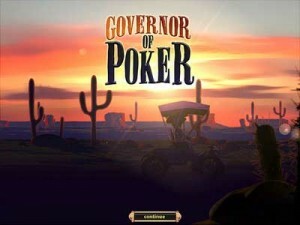 Do you have what it takes to become the Governor of Poker and take over all of Texas ?! Play as a male or female character in this totally original poker game. Battle your way in poker tournaments and win it all. Cash, fame , properties, transport assets and perhaps a title. Earn rewards for exceptional skills and achievements. In governor of poker you can really make it, and when you make it make it BIG ! From tournaments to virtual cash games .This card game for Windows features a simple property management system, a possibility to buy transport upgrades. When you make some name, you might even get newsflashes in the local papers of major events. Youda Governor of Poker brings you a trusted save game option, over hundred of different opponents all with a very sophisticated AI. Opponents really show different playstyles and act differently and realistic time and time again. This a all packed in a beautiful rendered environment with stunning 3D graphics. • The instant quick poker game. • Simple property management; transport upgrades. • Newsflashes in the local papers of major events. • Very sophisticated AI and different opponent player styles. • Beautiful 3D rendered graphics. • Tournament and cash games with save game options.